This montage represents the many areas of social services provided by K-W Habilitation Services. I was introduced to this organization by one of my customers who was a big supporter of this worthy group that was first supported by the Kinsmen Clubs in the Kitchener-Waterloo area. This wonderful organization does so many things to aid the less fortunate that the process proved to be very challenging. 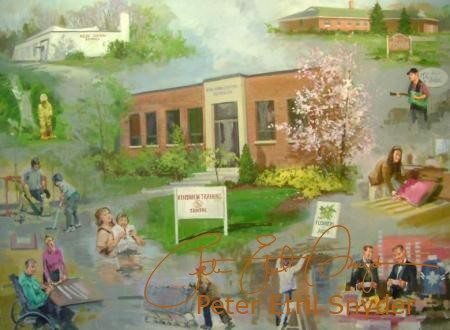 Using a mountain of photos from their various activities over the years, I contructed the painting for their boardroom. This piece was paid for by a friend of the organization. Although the poses of the girls were finally just right, there was considerable work and visits to a number of bakeries to get the elements. 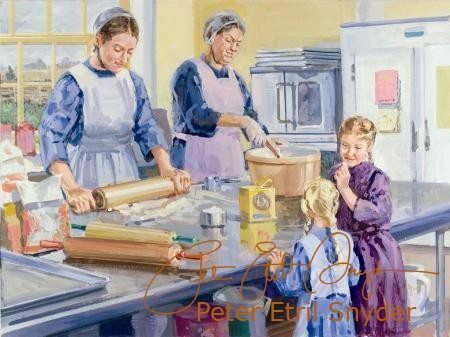 The ladies working the dough in the bakery were from a different set of photos that also presented some challenges. I culled the baking tools from the Internet because I wanted the old fashioned style of tins. I used an oven that is more modern because I observed them in a number of country bakeries. I moved the window several times as I wanted the view to be included but not to be too prominent. There was a country bakery that would have been perfect for the setting of this poem but even though both Nan and I visited and asked permission to take some photos, we were clearly not welcome. That seldom happens when I ask for a chance to take a few shots but perhaps the women felt that I would disrupt their work. Once again I pieced together from my files the various bits of information. 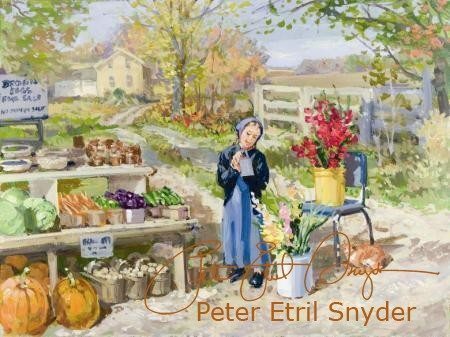 The gladiolus bunch in the pail on the chair, the produce stand itself, the baskets of potatoes, the cat, and the vegetables of so many colours were added to a farm lane that ended at a house. I must mention too the many photos of Maia, the author’s daughter, which were so helpful for the construction of this tentative but concentrated pose. This painting ended up in the author’s home. Strangely for such a complicated piece, it was the easiest to create. This road-side stand is so common in Mennonite country and yet so beautiful. Few experiences can beat a buggy ride on a pleasant summer day. 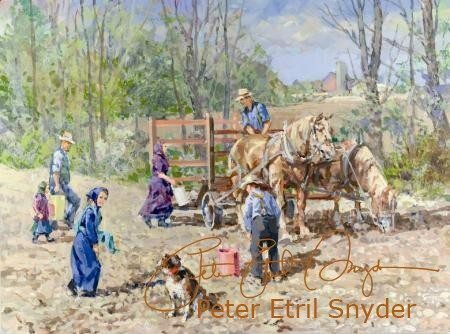 The author described the whole scene with the kids in the buggy passing the cornfields that this piece almost painted itself. I did take one liberty with facts which is the girls are not wearing bonnets, but I wanted for you to see their faces. This is the painting from the book that my wife chose to keep. The colour of the horse changed a number of times as I searched for the right balance. 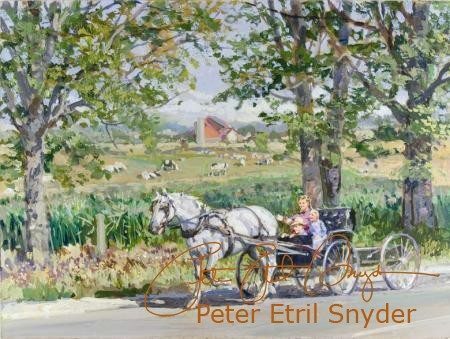 White buggy horses are really quite rare in the Mennonite groups but I decided that I wanted the visual punch that this strong contrast gives. The editor chose this image for the cover so I guess she agreed with the more dramatic choice that I made. I was fortunate to have received several Mennonite quilting photos from a former employee who lived in the country. 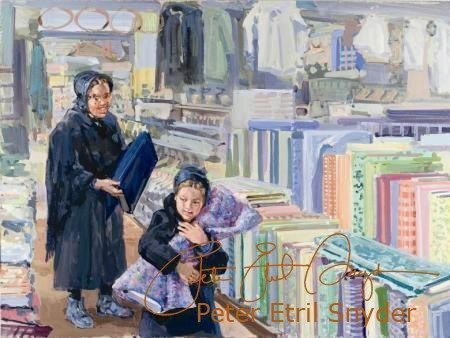 Using those shots along with a few that I had and the posed models of the girl and her great aunt on the extreme right of the painting, I created this interior scene. As a man it is very difficult to get permission to photograph inside a Mennonite home. 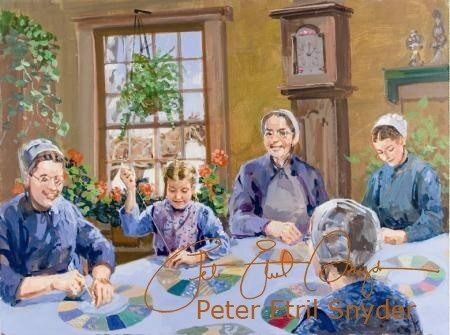 Over the years I have yearned to do more Mennonite home interiors but the opportunities have been few. Culturally, there is a barrier and now the current Bishop of the Old Order Mennonite Church has reinstated a ban on picture-taking. Because Mennonites of the Orthodox groups treasure the group above themselves, a number of women that I know that have been more liberal on the idea of photographs have declined my requests to snap a few shots in their homes. Once again the wheel turns. Using the general store in Wallenstein, I created a setting in the fabric section that worked with the story. The photos of the mother and of Naomi supplied by the author made my task much easier. Although the author had another store in mind as the setting, I felt that this space worked better. Nan and I worked together very well. Sometimes we had different concepts of the setting but there were no major differences. The editor was quite hands off, only occasionally having concerns that we were ready to handle. Since Nan and I are so immersed in the Mennonite way of life, we could answer our editor’s questions. It was a pleasure to work with our editor, Kathryn Cole. Using many photos from my files, I created a setting for Naomi. 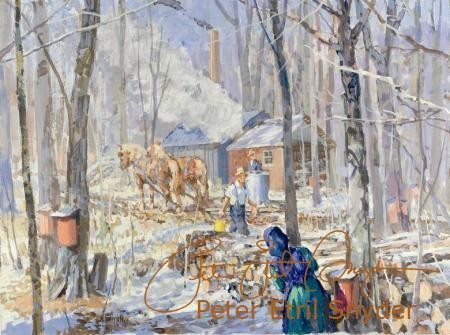 This is the first time that I have painted a view of the sugar bush where the focus is not on the gathering activity. 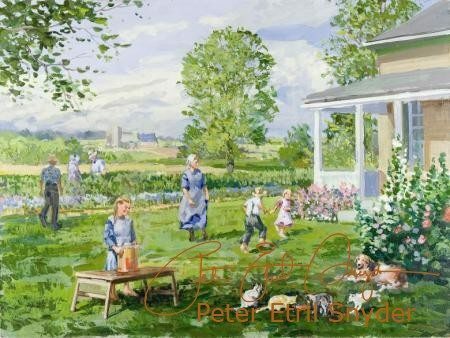 As with all of the paintings in this book, this piece changed a good deal over the month in which it was created. This was the only piece in the book over which Nan and I had had a debate with the editor. Kathryn’s impressions of sugaring seemed to be founded on the Quebec experience of sugaring off in a huge cauldron outside, not in a sugar shack. 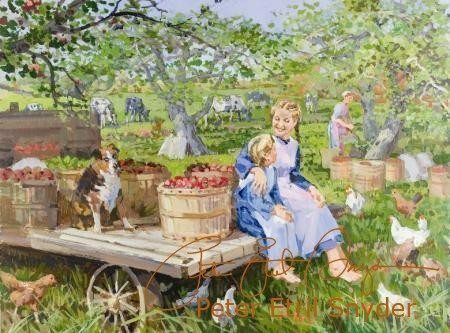 The poem that spawned this painting involves the entire family and speaks of the reward of churned ice cream after working hard picking fruit in the garden. I added the cats and the dog as I could not imagine this scene without the ever present, always hungry pets. It is hard to overstate the importance of food in Mennonite culture. Treats such as ice cream constitute both sustenance and reward. Hard work makes for a good appetite.